From the moment you meet Megan and her team you get a genuine feeling that they love what they do and truly care about the customer. This is something that we wanted to echo throughout the entire rebrand. Megan was keen to have something that was both professional looking, but also very friendly and fun with a hint of vintage style. The old branding was very dark and angular so we wanted to move away from this and develop a much lighter and fresher appearance. We looked at each aspect of the business where design consistency was required and worked closely with Megan and her team to ensure every requirement was met to their satisfaction, from the design of the logo and website, right through to stationery, property details, advertising and shop facia. The Megan Baker Estate Agents corporate stationery design continues the fresh new style. The business cards were coated in a soft touch laminate and had a picture of each team member on the back lifted out with a nice bit of spot UV for that added contrast. The Megan Baker Estate Agents sale boards were completely revamped with the new branding, but retained their distinctive diamond shape. Megan Baker Estate Agents Corporate folder. Printed on a nice touchy feely uncoated stock. 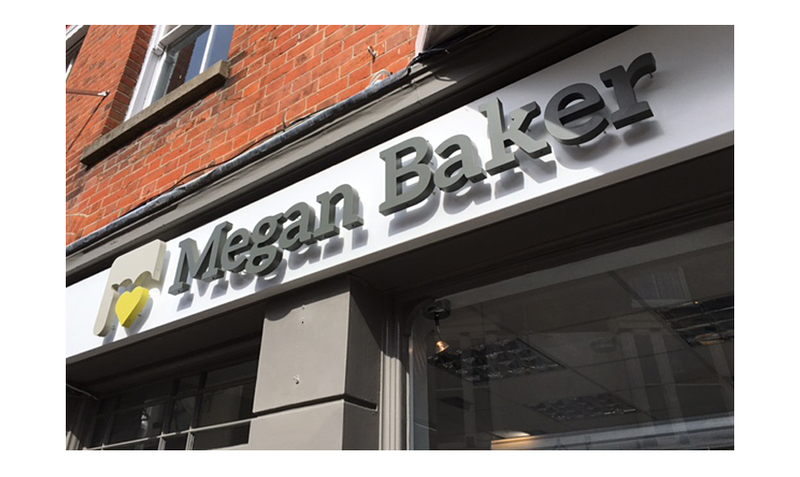 The logo on the Megan Baker Estate Agents shop front was made out of raised aluminium letters and backlit with LED lighting to give a glow at night time. We also used etched glass vinyls to pick out the repeat flower pattern as detailing on the windows.